Those are the first words that Astrid ever spoke to me. At that time, I was overwhelmed with hatred; I hated her as the leader of a company which was becoming increasingly wealthy in the midst of widespread starvation. Now that we’ve started to come out the other side, it seems like a fading nightmare. Crop monocultures contributed to a rapid spread of disease outbreaks. The resulting crippling of global agriculture was worsened by the increased frequency of extreme weather events. Panicked attempts to respond to this crisis in global food production generated major increases in nutrient pollution, which in turn changed marine species compositions and led to the growth of deep-water dead zones. It seemed as if Thomas Malthus and his prognostications of catastrophe in the face of population pressure would be vindicated after all. The only one who did not seem to be panicking was Astrid. No, Astrid was dreaming, scheming, planning. Now that she is gone, all I can think about is how much I miss her. Today, few people are unaware of Astrid or her life’s work, but it was not always this way. As the young, impatient scion of a prominent Norwegian fishing family, Astrid Amundsen progressed rapidly through the ranks of her family firm, FISH Inc. - known for its deep sea trawling, processing, bio-engineering, and aquaculture. At only 25, when most of us are adrift, Astrid became CEO. However, the firm Astrid now led was in a dire situation as a result of their inability to cope with the ‘jellyfish deserts’ plaguing the oceans of the 2040s. As Astrid sunk vast sums into futile attempts to combat this threat and wrestled with unhappy shareholders, the Arctic ice continued to melt and humanity faced catastrophe. FISH Inc. aggressively purchased lease-rights from industry to operate within strategic pockets of the Arctic, as she was able to take advantage of the anarchy that followed the acrimonious collapse of multilateral attempts to govern the region. This was why I despised Astrid’s efforts, and why others held her to be possessed of a unique brilliance. By virtue of her ability to manipulate the situation, FISH Inc. began to experiment with fully integrated production chains, at an unprecedented scale. FISH Inc.’s history of large-scale experimentation started in semi-enclosed systems, including the Black, Baltic, and Bohai Seas, as well as the Chesapeake Bay, where they had been able to pilot many of the technologies that would soon have a global and surprising impact. The centrepiece - Super Tuna® - bio-engineered for remarkable resilience to changing ocean conditions, soon became the key product for FISH Inc. These tuna were fed with small pelagic fish whose abundance was supercharged by artificially increasing marine primary production in the areas of highest ocean productivity in the Arctic and in upwelling zones. Migration routes were manipulated through the secretion of synthetic ‘pheromones’ from robotic submersible drones travelling ahead of the schools, affectionately referred to by Astrid as ‘Hammer Heads’. When grown, these tuna were herded to processing zones for subsequent transport and sale to consumers. The astronomical costs of these operations continued to generate skepticism from the financial markets, but revenues soon soared as demand rose for Super Tuna® and Astrid continued her ascent towards corporate stardom. As global income disparities continued to widen, pirates and commerce raiders scoured the high seas in hope of profiting from the copyrighted Super Tuna® on the black market. Astrid reacted with terrifying tenacity against such attacks on her operations, in her private “War of Food”. Actually, I recall ambushing her in a quiet corridor during a shareholder meeting. I told her softly but vehemently as she strode past that she was destroying the oceans and that it was profiteering criminals like her that had led us into a global environmental meltdown. She stopped, wheeled around, moved in close, and spoke those fateful words with which I opened this obituary. My fierce attitude towards her was not without merit. I, and many others, had vigorously attempted to stop the intensification of FISH Inc. production, which had brought Arctic ecosystems to the brink of collapse. Consequently, the International Court of Justice indicted FISH Inc. for their legally suspect purchase of use rights in the Arctic. In the confusing aftermath of the proceedings, as the case fell apart, Astrid and I found each other. However, our new found intimacy was never able to dampen our adversarial intellectual relationship. The English political economist Thomas Malthus once wrote that: “The power of population is indefinitely greater than the power in the earth to produce subsistence for man.” During the 21st century food crisis, along came Astrid, who, like a modern day version of his original nemesis Ester Boserup, was able to once again thwart Malthus. Astrid Amundsen was undoubtedly one of the most polarising corporate leaders in modern history and her legacy will remain complicated. There is no doubt that her efforts saved the lives of many millions but the ultimate cost to marine ecosystems is still unknown. 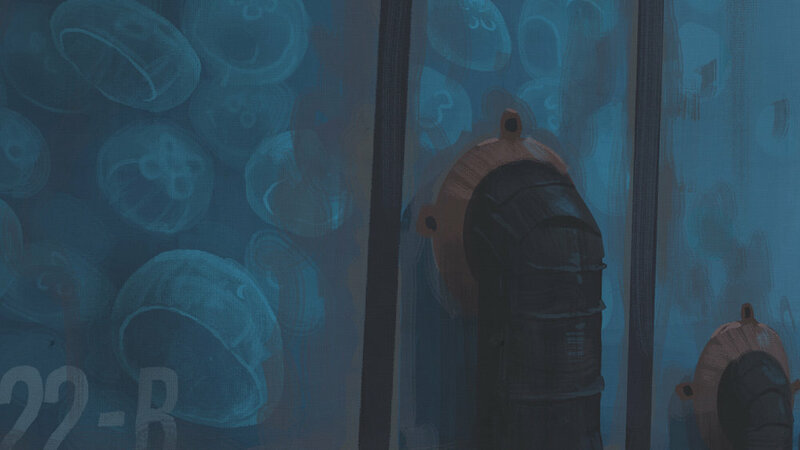 Perhaps, Astrid’s attack on the jellyfish deserts will outweigh the damage of her relentless efforts to farm the seas. As she left this world forever, Astrid knew that she had been able to do what no one else could, and that she achieved her goal with single-minded purpose and clarity. I, on the other hand, am worried that big solutions beget big problems, and Astrid is gone.